#1.2.1 What to look for in a survival watch? #1.2.2 Why you’ll need a survival watch in a crisis? #1.2.3 How to tell direction with a survival watch? #1.2.4 How to find direction at night using an analog watch? #1.2.5 What is an altimeter watch used for? #1.2.6 What kind of watches do military wear? You aren’t going to always have access to your phone. During emergencies, such as natural disasters, it’s important to know things like the time. So, what can you use if you don’t have access to your phone? Well, a survival watch is a great option. That being said, continue reading to learn more about the ten best survival watches on the market! Provides analog and digital time. Determines direction, altitude and temperature. Large size makes it easy to read, even in the darkest and most uncomfortable environments. Batteries last for several weeks. Although the batteries last for a long time, the automatic light will dim and eventually shut off as the batteries run low. While this is a great way to determine you need to replace the batteries, it’s annoying. Made by one of the most popular watch manufacturers in the world, the CASIO G-SHOCK MUDMASTER GWG-1000-1AJF is one of the most raved about survival watches on the market and here’s why! Yes! 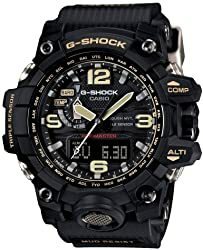 In fact, the CASIO G-SHOCK MUDMASTER GWG-1000-1AJF is one of Casio’s most durable models to date. Everything you need to know about the watch lies within the name. After all, this watch is called the Mudmaster. That’s because the CASIO G-SHOCK MUDMASTER GWG-1000-1AJF is completely mud and vibration resistant. So, you don’t have to worry about harsh or inclement conditions damaging or even ruining your watch. Aside from telling time, what other things can this watch measure? That’s right! The CASIO G-SHOCK MUDMASTER GWG-1000-1AJF measures a lot more than just time. 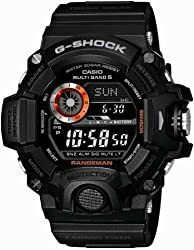 In fact, the CASIO G-SHOCK MUDMASTER GWG-1000-1AJF has a triple sensor feature. This means that it can also tell direction like a compass, as well as determine altitude and temperature. All of these features are extremely beneficial during emergencies, such as if you get lost while hiking. How big is this watch? The CASIO G-SHOCK MUDMASTER GWG-1000-1AJF is pretty much as big as a watch comes. More specifically, it is 56 mm and 18 mm deep. After all, it makes sense because the watch has various features and is able to tell time in analog and digital notation. Sleek, discreet and minimalistic design. GPS feature that tracks where you’re going, so you can measure things, such as your steps and distance. This is also helpful for finding a location again. Barometric Trend to determine if there are any sudden changes in the weather. Battery lasts for approximately 100 hours. Lighting is subpar. So, unless you’re in a well-lit area, it might be a little bit difficult to view your watch. GPS signal is a little bit faulty as watch ages. The Suunto Traverse is a minimalistic survival watch that offers an innovative and revolutionary take on the classic survival watch. That being said, check out all of its amazing features below. What is the coolest feature of this survival watch? The Suunto Traverse is truly a watch from the future. That being said, its equipped with various innovative and revolutionary features. So, it’s tough to pick the coolest. But, if I had to pick I would say that the GPS routes are pretty convenient. Basically, the Suunto Traverse uses GPS to track and document routes and terrain. Then, it translates this information into a graph that showcases the route. This survival watch also tracks things, such as distance. What does the Suunto Traverse do with the GPS data? Once you have calibrated a location into the Suunto Traverse, it takes this information and saves it. From there, you can see things, such as the distance you traveled and how many steps you took. If you need help returning to your starting point, you can use the breadcrumb trail function that shows you where to go. Obviously, this is a great feature to have if you’re hiking or exploring an unfamiliar area. 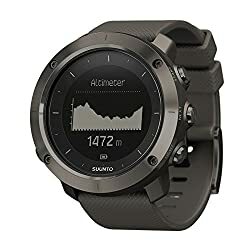 Does the Suunto Traverse track anything in the atmosphere? Yes! The Suunto Traverse is actually extremely aware of the weather around you. It even has a feature known as the Barometric Trend that will alert you whenever there is going to be a sudden change in weather. The Barometric Trend is specifically designed to detect storms. In the event that a storm is going to occur, the Suunto Traverse will release an alarm sound. This will let you know that you should head home or seek the nearest shelter. Triple sensor feature means this Casio watch measures a lot more than just time. Large size makes it extremely easy to view and use anywhere at any time, even during the toughest situations. Carbon fiber wears over time. Since there are a lot of features on the screen, it can be difficult to find what you’re looking for if you’re in a time crunch. You shouldn’t be surprised that another Casio watch is featured on this list. Check out why this Casio watch is different yet just as good as the other Casio watch! Does this watch measure just time? Just like the first Casio watch we reviewed, the Casio Men’s GW-9400BJ-1JF G-Shock Master watch has the innovative triple sensor design that measures more than just time. If you need a little bit of a refreshment, the triple sensor feature measures altitude, temperature and determines the direction you’re going, just like a compass. Yes! 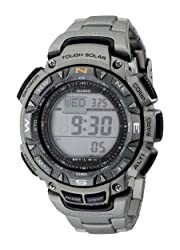 In fact, the Casio Men’s GW-9400BJ-1JF G-Shock Master watch ranks in as one of the most durable watches on the market. This survival watch is equipped with a level of ruggedness and strength that makes it shock resistant. These qualities are most likely due to its carbon fiber composition, which makes a secure and durable foundation that’s resilient to various materials and conditions. Carbon fiber is also extremely comfortable to wear for a long time. Stainless steel design creates a sleek and fashionable look you rarely find in survival watches. Alerts you when battery has a low charge. Ability to swim to depths of up to 660 feet. Button clasp is extremely easy to use and secure. Dual time feature makes it easy to detect time in two different time zones. Issues, such as slowed use, often arise with the second time zone. Watch does not come with an instruction manual. So, if you have any questions on how to use, maintain, or repair, your watch you’re going to have to contact the manufacturers directly or head to the internet to do some research. While many survival watches have a bulky composition and a simple black design, the Citizen Men’s Eco-Drive Promaster Nighthawk Dual Time Watch has a sleek and fashionable silver design. But, the Citizen Men’s Eco-Drive Promaster Nighthawk Dual Time Watch offers a lot more than just a pretty design. Check out everything this survival watch has to offer below! What is this survival watch designed with? The Citizen Men’s Eco-Drive Promaster Nighthawk Dual Time Watch is made with stainless steel. More specifically, this survival watch is designed with 42 millimeters of stainless steel that utilizes a simple button clasp that folds over to enclose. Is this survival watch durable? Yes! Just because the Citizen Men’s Eco-Drive Promaster Nighthawk Dual Time Watch is pretty doesn’t mean that it doesn’t have any resilience or durability. 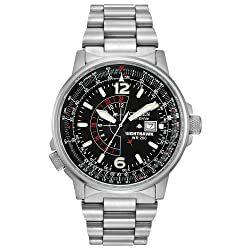 In fact, the Citizen Men’s Eco-Drive Promaster Nighthawk Dual Time Watch is one of the most durable watches on this list. Despite being made of stainless steel instead of something more typical of survival watches, such as carbon or nylon, the Citizen Men’s Eco-Drive Promaster Nighthawk Dual Time Watch is actually waterproof. Yup, that’s right. You can swim up to depths of up to 660 feet and your watch will still work. This aspect is great because it also means that this watch will work during inclement weather, such as heavy rain. Triple sensor feature allows you to track things other than time, such as altitude, temperature and direction. Option to calibrate five alarms that will go off on a daily basis. Subtly alerts you every hour. Auto calendar, so you won’t ever have to worry about keeping track of the date ever again. Clasps are thin and flimsy. Not as durable as other survival watches. When you think of a survival watch, you most likely think of a watch that looks like the Pro Trek Men’s PAG240T-7 watch. But, does this watch live up to its appearance? What is the most useful feature of this survival watch? The most useful feature of the Pro Trek Men’s PAG240T-7 is argumentatively the triple sensor that measures altitude, temperature and detects direction just like a compass. 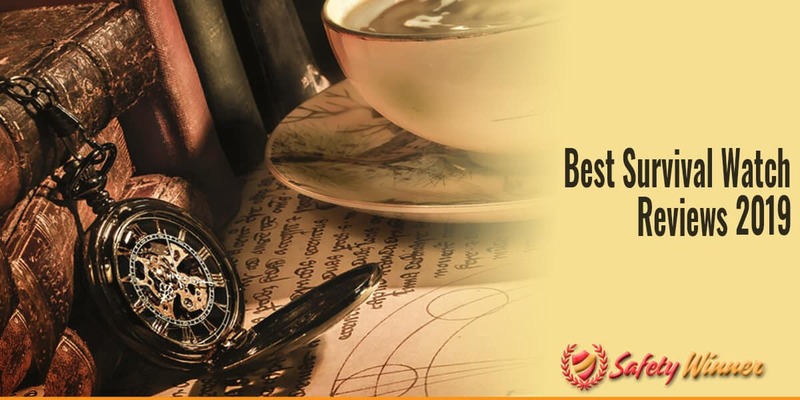 Obviously, these features are extremely useful in an emergency because you will be able to gain some sense of direction, as well as have general information about the area around you. If your Pro Trek Men’s PAG240T-7 watch detects a change in altitude or temperature, you will be able to seek shelter in an adequate amount of time. Aside from telling time, what other features does this survival watch have? The Pro Trek Men’s PAG240T-7 has a ton of features related to time. For example, you can calibrate up to five alarms that will go off on a daily basis. Obviously, this is a great feature for people who need little reminders throughout the day and might not have access to their phones at all times. Aside from five daily alarms, the Pro Trek Men’s PAG240T-7 also has a feature where it subtly alerts you every hour. This is a great way to keep track of time. Finally, the Pro Trek Men’s PAG240T-7 comes with a timer, stopwatch and even a calendar. Therefore, you won’t ever have to worry about keeping track of time ever again. Triple sensor allows this survival watch to measure altitude, temperature and distance, as well as time. Includes additional time related features, such as a timer, stopwatch, alarms and even a calendar. Easy to secure buckle closure. Water resistant and can sustain water depths of up to 660 feet. The alarm does not include a vibration. Light changes sporadically, which influences your ability of viewing and using the watch. Thermometer feature isn’t always accurate if you’re wearing the watch. Yes, there’s yet again another Casio watch. This time it’s the Casio Men’s GW-9400-1CR Master of G Stainless Steel Solar Watch that’s in the hot seat. Check out the features below! Does this survival watch have any abilities other than telling time? Yes! Like most Casio watches, the Casio Men’s GW-9400-1CR Master of G Stainless Steel Solar Watch is equipped with the triple sensor feature, which allows it to detect altitude, temperature and direction. The Casio Men’s GW-9400-1CR Master of G Stainless Steel Solar Watch also has a variety of features related to time, such as the ability to calibrate up to five alarms that ring on a daily basis, as well as a timer and a stopwatch. The Casio Men’s GW-9400-1CR Master of G Stainless Steel Solar Watch is actually one of the most resilient survival watches on the market. In fact, it’s often regarded and praised for its water resistance. With the Casio Men’s GW-9400-1CR Master of G Stainless Steel Solar Watch, you’re able to travel in water up to 660 feet deep. To put this distance in perspective, this is a decent distance for people who scuba dive recreationally. That being said, since the Casio Men’s GW-9400-1CR Master of G Stainless Steel Solar Watch is able to withstand up to 660 feet of water, it can also withstand inclement weather, such as heavy rain. Extremely durable. So, you don’t have to worry about sudden changes in temperature, altitude, or weather interfering with the functionality of your watch. Also, this survival watch is water resistant. Simple and sleek design makes it extremely easy to use and read this survival watch, especially when you’re in a bind. Automatic night view makes your watch brighter and easier to view. Although this survival watch is often regarded for its durability, the front face of the watch is easy to scratch and scuff. As the watch wears, the hands slow down and begin to malfunction, especially if the watch has experienced an influx of inclement weather. The MARATHON WW194013 Swiss Made Military Issue Milspec Navigator Quartz is supposedly good enough that military personnel should want to use it. So, let’s take that into consideration and analyze all of its features! Yes! After all, the MARATHON WW194013 Swiss Made Military Issue Milspec Navigator Quartz is designed with pilots, law enforcement and military personnel in mind. That being said, this survival watch was created with premium durability in mind. That’s why the MARATHON WW194013 Swiss Made Military Issue Milspec Navigator Quartz has a composition made out of tritium gas tubes, composite stainless steel and plexi glass. Let’s put it this way: with all of these materials, you won’t ever have to worry about your watch malfunctioning or breaking from common environmental factors, such as inclement weather. Is this survival watch easy to use and view? Fortunately, the MARATHON WW194013 Swiss Made Military Issue Milspec Navigator Quartz is one of the easiest survival watches to use and view. 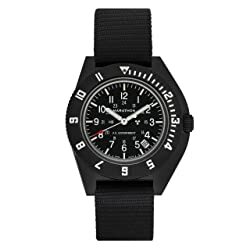 Seriously, this survival watch as a simple and sleek design that isn’t overpowered or overflooded with an influx of information like other survival watches. In fact, the MARATHON WW194013 Swiss Made Military Issue Milspec Navigator Quartz even has a special night view in which it automatically creates a brighter glow. So, you will be able to read and use this watch all hours of the night. CAT resin strap and general composition make this survival watch extremely durable. In fact, this watch passes inclement weather simulations, as well as being shock and water resistant. Lightweight, so you won’t even realize you’re wearing your survival watch for an extended amount of time. Also includes a stopwatch, timer and even an alarm feature. Not as durable as it’s marketed. The Timex Men’s Expedition Digital Shock CAT Resin Strap Watch is popularized for its durability and ruggedness. But, is this survival watch truly as durable as it markets itself as? Yes! The Timex Men’s Expedition Digital Shock CAT Resin Strap Watch features various features that makes it one of the most durable survival watches on the market. Firstly, the Timex Men’s Expedition Digital Shock CAT Resin Strap Watch is tested in an extensive outdoor torture simulation, which is meant to ensure premium quality. 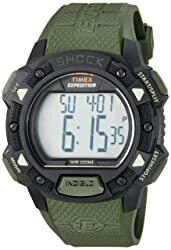 Aside from the tests that Timex run and regulate, the Timex Men’s Expedition Digital Shock CAT Resin Strap Watch is known to be shock and water resistant. In fact, this survival watch can sustain water depths of up to 330 feet, which is definitely deeper than any pool. Does this watch have any functions other than telling time? Since the Timex Men’s Expedition Digital Shock CAT Resin Strap Watch is a watch, of course its main function revolves around telling time. Aside from telling time, the Timex Men’s Expedition Digital Shock CAT Resin Strap Watch has the ability to act as a stopwatch or a timer. You also have the option of calibrating a few alarms in this survival watch. Water resistant up to 165 feet deep. Velcro strap is easy to take off and secure. Simple design makes it extremely easy to use and view, especially in emergencies. The simple design means it doesn’t have any special features, such as alarms or triple sensors. The Timex Men’s Expedition Gallatin Watch is another Timex model that is one of the most popular survival watches on the market. Check out why this Timex survival watch is so popular below! Is this watch comfortable and efficient to wear? The Timex Men’s Expedition Gallatin Watch features a simple Velcro strap that makes it extremely easy to take off and secure this watch. Also, the lightweight design makes it extremely comfortable and efficient to wear the Timex Men’s Expedition Gallatin Watch for an extended amount of time. The Timex Men’s Expedition Gallatin Watch is designed to withstand rugged environments, such as a construction site. Aside from general natural terrain, the Timex Men’s Expedition Gallatin Watch is designed to withstand water depths of up to 165 feet. Although this isn’t as deep as some of other survival watches, it’s good to put this depth in perspective. For example, this watch is suitable to use during recreational swimming and water sports, as well as inclement weather, such as heavy rain. Scratch, water and shock resistant. So, you don’t have to worry about daily tasks or inclement weather ruining your watch. Offers analog and digital time and even a dual time option so you can view two different time zones at once. Features a calendar, alarm, stopwatch and even a subtle alert on every hour. While it is durable in terms of external factors, internal features are not always in tip top shape. This is a manufacturing problem. Strap is flimsy and not as secure. Although the ETEVON Men’s ‘Captain’ Stylish Outdoor Sport Watch is on the bulkier side, it has one of the sleekest designs out of all the survival watches currently on the market. But, the ETEVON Men’s ‘Captain’ Stylish Outdoor Sport Watch has so many more features than just its sleek design. How is this survival watch multifunctional? The front face of the ETEVON Men’s ‘Captain’ Stylish Outdoor Sport Watch features many sections. Firstly, the entire interface is an analog watch within itself. Then, there are three smaller digital buttons that feature two different time zones, as well as an additional feature bubble. Aside from telling time, what other features does this survival watch offer? The ETEVON Men’s ‘Captain’ Stylish Outdoor Sport Watch offers a variety of features, such as a calendar, alarm, stopwatch and even a chime that alerts you on an hourly basis. Yes! In fact, the ETEVON Men’s ‘Captain’ Stylish Outdoor Sport Watch is designed to withstand water depths of up to 98 feet. This means that this survival watch is also able to withstand daily interactions with water, such as showering and washing your hands. This watch can even withstand heavy rain. 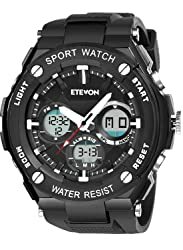 In addition to being water resistant, the ETEVON Men’s ‘Captain’ Stylish Outdoor Sport Watch is shockproof and known to withstand extremely cold temperatures. So, you definitely don’t have to worry about inclement weather ruining this survival watch. #1 What to look for in a survival watch? A survival watch should ultimately provide you with an influx of information in a condensed, yet easy to read, way. It’s also important for a survival watch to be flexible and comfortable. After all, you’re most likely going to be wearing it for an extended amount of time. Typically, a survival watch should be shock and water resistant. Obviously, it’s extremely important that it tells time in an efficient and accurate way. Your survival watch should also have extra features, such as the ability to detect temperature and determine direction and distance. #2 Why you’ll need a survival watch in a crisis? Mobile phones aren’t always the most reliable piece of technology in an emergency. Most of the time, phones aren’t helpful in an emergency because there is no signal or their battery has died. That’s when a survival watch comes in handy. Of course, a survival watch is helpful for telling crucial information, such as date and time. You can even set an alarm on your watch to alert you to do something while you wait for help. For example, an alarm can alert you to wake up, start a fire, or even start walking in an attempt to find civilization again. Most of the time, survival watches are equipped with additional features, such as GPS and the ability to detect changes in the atmosphere in terms of altitude and temperature. These features can help you determine what you need to do in order to survive. In fact, a GPS could even lead you back to civilization. #3 How to tell direction with a survival watch? If you can find north utilizing a survival watch, you will be able to determine all the other directions. The process is simple. First, start by placing the watch in the middle of your hand and just holding it. Then, make sure the hour hand is pointing towards the sun. Next, utilizing your hand, or a pen and paper, bisect the hour hand and the watch’s 12. Now, the end of this line will be facing the north direction. For an additional tip, it’s important to keep in mind that the east is where the sun rises, so that means the west is the direction the sun sets. #4 How to find direction at night using an analog watch? You can utilize the above method with an analog watch. But, it might be hard to do this at night. In case you need to find direction at night simply place one stick in the ground and lie down so you are at eye level with it. #5 What is an altimeter watch used for? An altimeter watch is basically used to measure altitude. Altitude is important because it determines the air pressure of an area, which in turn can determine things like weather conditions and temperature. Altitude can also measure the depth of water. #6 What kind of watches do military wear? Most military personnel wear g-shock watches because they are equipped with additional features that come in handy. For example, most g-shock watches have a compass and thermometer feature. Also, g-shock watches are typically more durable than other kinds of watches. So, they can withstand inclement weather and extreme environments.